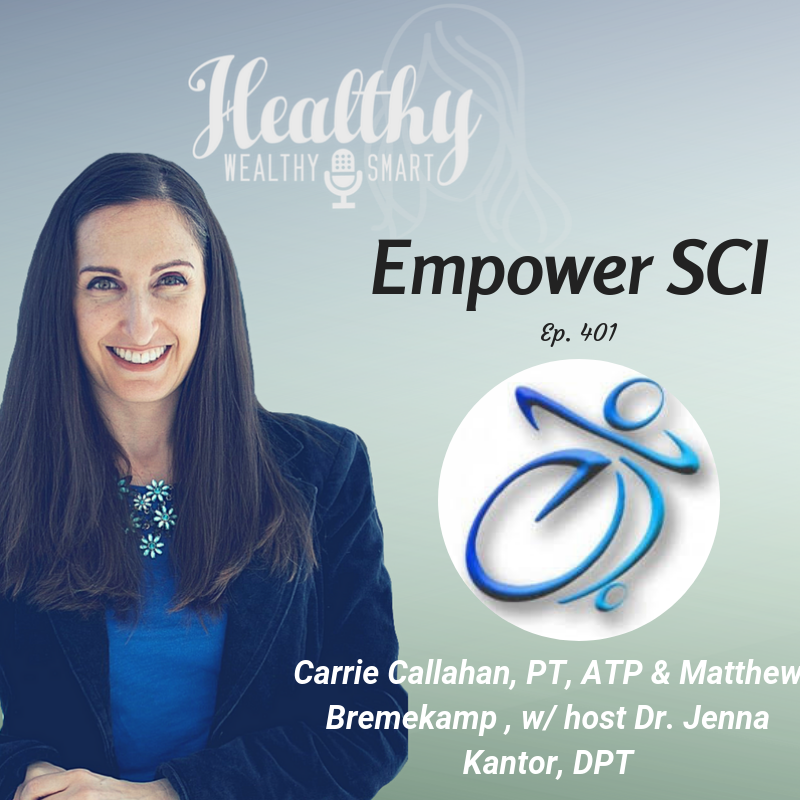 On this episode of the Healthy Wealthy and Smart Podcast, Jenna Kantor, DPT guest hosts and interviews Carrie Callahan and Matthew Bremekamp on the non-profit Empower SCI: a residential rehabilitation program for individuals with spinal cord injuries. Carrie Callahan is a physical therapist and one of the founders of Empower SCI and Matthew Bremekamp was a participant in the program who has now become a mentor with Empower SCI. Carrie Callahan has practiced physical therapy for over 12 years, graduating from Ithaca College in 2003. She currently specializes in seating, positioning and wheeled mobility, earning her Assistive Technology Professional Certification in 2015, and now holds a position as Territory Sales Manager for Permobil, TiLite and ROHO products in the Boston area. She has a passion for teaching manual wheelchair skills, and has led Empower SCI in teaching these skills at Abilities Expos and through day courses for students, therapists and wheelchair-users in the Long Island and Boston communities. She also enjoys taking part in the adaptive sports community through Spaulding Adaptive Sports Centers, and in January of 2016, she was part of a team of one doctor and three clinicians who pioneered the monthly Adaptive Sports Medicine Clinic at Spaulding Rehabilitation Hospital. At Empower, she is co-founder and president of the program, leader of wheelchair skills activities, leader of the Knobby Tire Ride and Roll Fall fundraiser, coordinates participant applications and communications, and loves to co-lead the Back on Board surfing event each July with the Testaverde Foundation. Empower SCI is a non-profit corporation established to enable individuals with spinal cord injuries to lead happier, more meaningful and more independent lives. Empower SCI seeks to fill the gap in the rehabilitation industry that has been created by a decrease in length of stays at rehabilitation hospitals and outpatient services during the recovery from a spinal cord injury. Through community outreach and a two week residential rehabilitation program at Stony Brook University in Long Island, NY, Empower SCI will provide the knowledge, tools, strength, and support that individuals with spinal cord injuries need to thrive.